This macaroni and cheese dish is the first thing I remember creating/making on my own. Sure, I always helped my mom cook and bake growing up, but she actually never made us mac and cheese from scratch. Now, now, don't go bashing my mama. It just wasn't her thing. Because of that, I was on my own. Somewhere between middle school and high school I dove into learning how to make macaroni and cheese from scratch myself. Because I heard good things - really good things. 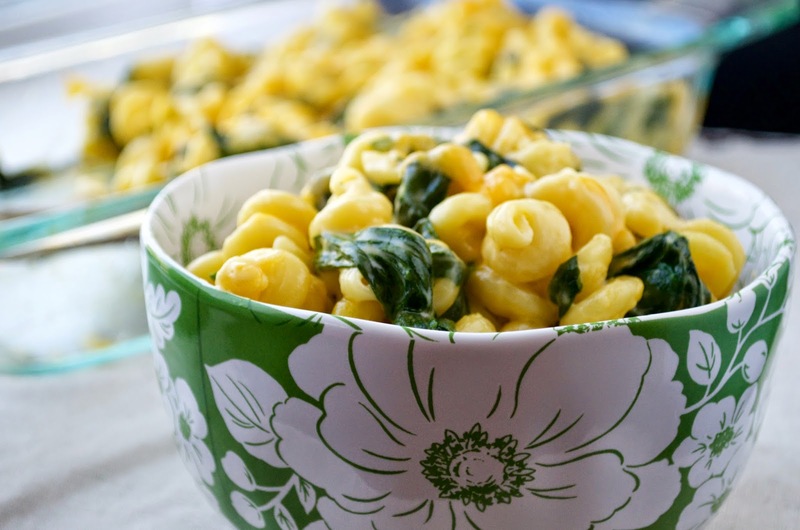 Mac and cheese was my ultimate favorite food - and it totally still is to this day! 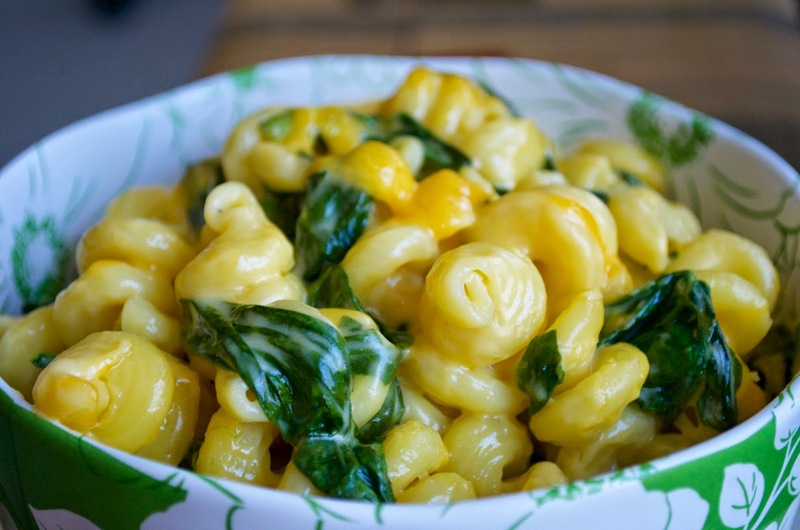 Nothing hits the spot like a good ol' box of Kraft but I wanted to make it myself so I could make it as gooey and cheesy as I wanted to (and to see what all the fuss was about). I remember using so much of my internet time (Monday night was my internet night), looking up how to make a cheese sauce. It's a simple concept but I was young - I knew nothing! What was a roux? It's butter and WHAT? Flour? NO. Then I decided to throw in some veggies. What if I added spinach? Once I had it down, I was hooked. I have been making it from scratch ever since! 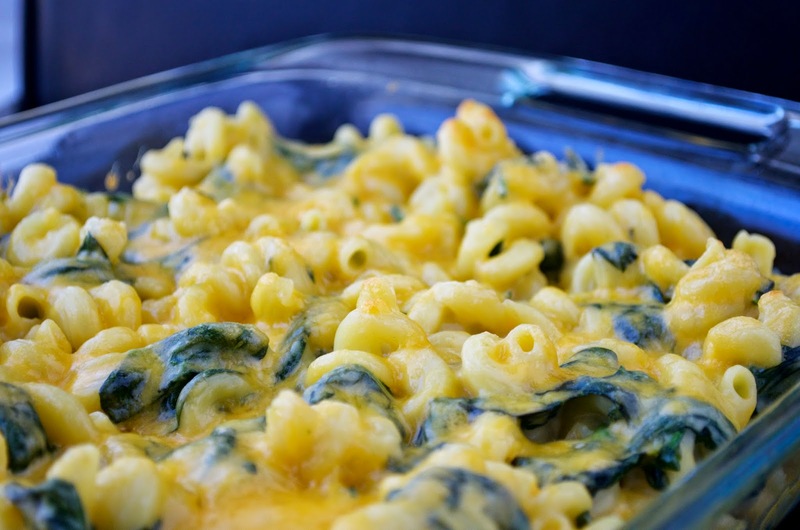 Sure, Kraft is still a staple in my cabinet, but when I really want some comfort - I go for this mac recipe. I should have known right then that I'd have a future in food blogging (OK so my blog is only 1/4 focused on food - who's keeping track?) but I was so young! So naive! I had no clue what was in store! Well, by now, I have mastered a damn good cheese sauce, if I do say so myself, and it's been one perfected over time. 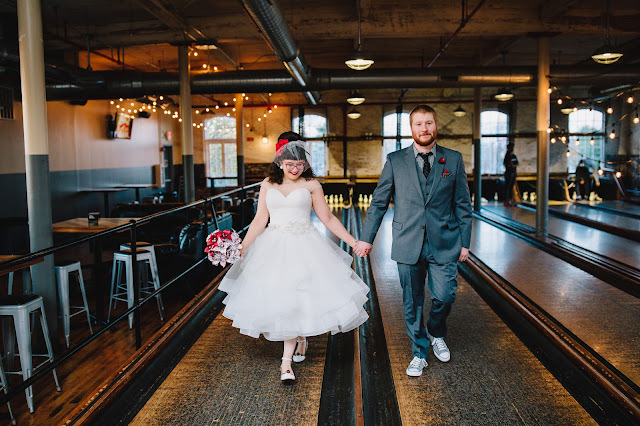 Cody and I have fun with it whenever we make it by adding in whatever we have handy or thinking of new crazy mix-ins like buffalo chicken (his favorite) or other veggies like mushrooms and broccoli (my favorite). 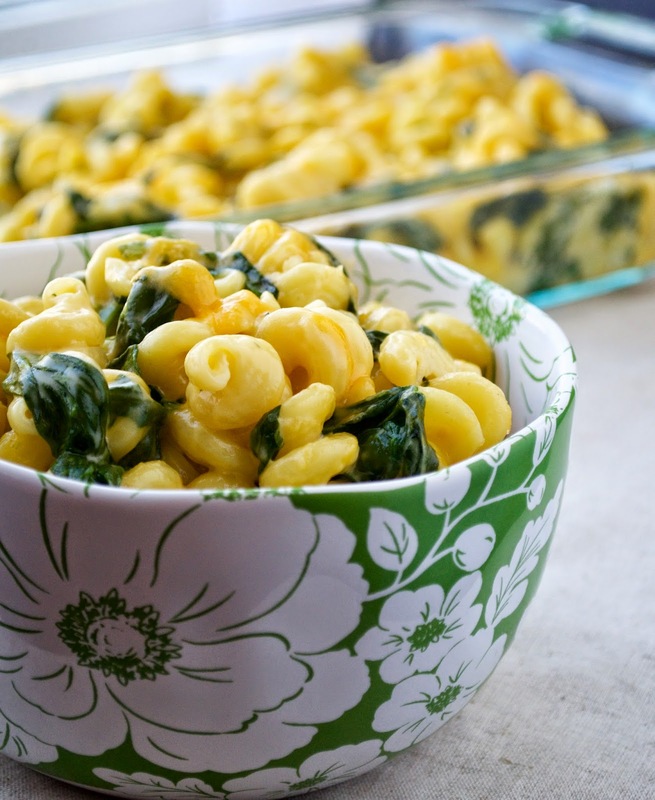 By the way, why a kid chose to add spinach to mac and cheese is beyond me. That doesn't matter though because in the end, I am so glad that I did. 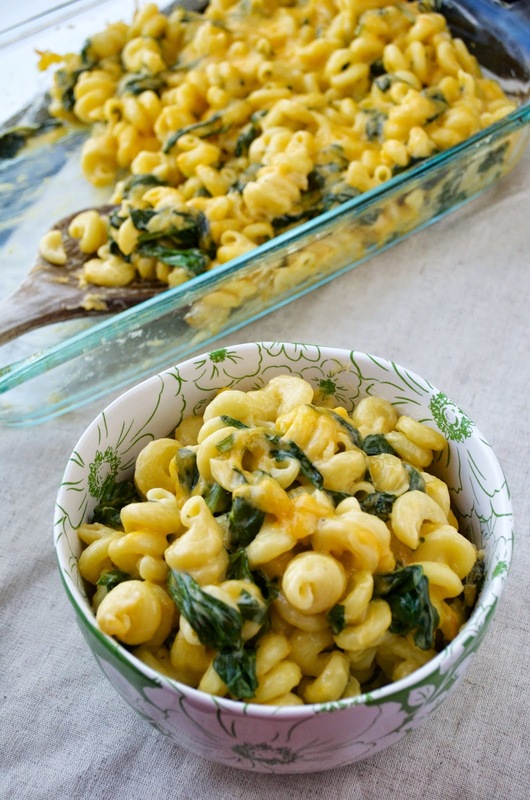 The spinach paired with the sharp cheddar in the sauce makes for the perfect salty and gooey combination. It's heavenly. Plus, it all comes together within 40ish minutes. How awesome is that? 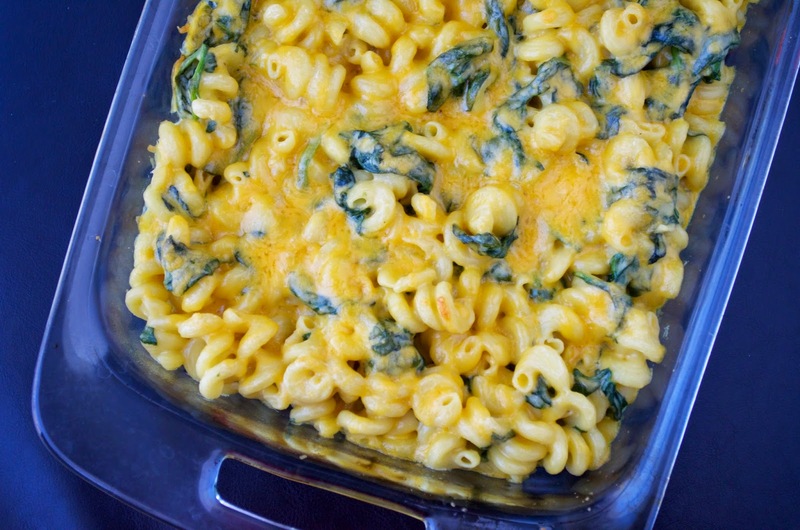 Preheat oven to 350 degrees (you can bake this mac or you can eat it out of the pot - whatever floats your boat). Bring a tall pot of water to a boil and cook your pasta according to the directions on the box. In a large saucepan (to make easier clean up, I usually use the pot I made my pasta in! ), melt the butter over medium heat. Whisk flour into the melted butter until smooth. Cook for about a minute until slightly brown and bubbly. Slowly stir in milk and half & half. Carefully fold in your spinach (as it wilts, it will mix in wonderfully) and continue to stir until sauce thickens to your liking. If you like your sauce more saucy, feel free to add more milk a little at a time. Butter a 9x13 baking dish and load it up with your mac mixture. Top with any extra cheese you may have. Bake 15-20 minutes or until crispy and golden on top.